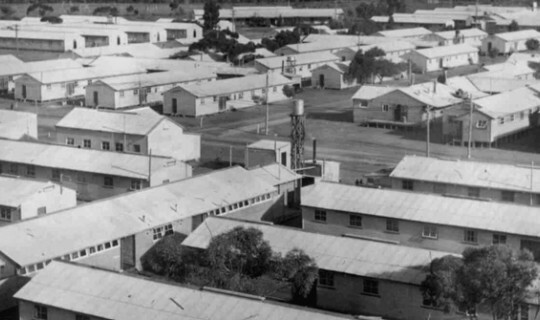 Dr Alexandra Dellios will present a lecture about the “Greek experiences in Australia’s migrant camps”, on Thursday 29 June, at the Greek Centre, as a part of the Greek History and Culture Seminars, offered by the Greek Community of Melbourne. A large influx of Greek migrants arrived in Australia from 1953 to the late 1950s. Half of them were assisted by the Australian government under a scheme established with the Intergovernmental Committee for European Migration; almost all of these 15 000 Greeks therefore passed through a Department of Immigration reception centre like Bonegilla (in Victoria), Northam (in Western Australia), or Greta (in NSW). The remainder were privately sponsored by Greeks already resident in Australia. This established an extensive network of chain migration that determined the pattern of Greek migration to Australia for decades: that is, the majority of Greek immigrants were privately sponsored, and thus managed to avoid temporary accommodation in immigration reception centres. Dr Delios in her lecture will consider the experience of those 15 000 assisted Greek migrants who spent time in centres like Bonegilla, the Department of Immigration’s largest and longest running ‘Reception and Training Centre’ located on the border of New South Wales and Victoria. The first issue that stands out is that of family separation within Australia. The conditions of the two year work contract meant that most assisted migrants experienced family separation across Australia’s network of immigration reception centres, holding centres and worker’s hostels. In her lecture Dr Dellios will explore how Greek migrants in particular responded to these bureaucratic restraints. Admittedly, gender disparities in Greek migration in the early 1950s meant that centres could become male-dominated spaces, with a ‘much missed family atmosphere’. “I will therefore also explore the lived experiences of young, single men within the space of the migrant centre,” she said. Alexandra Dellios is an oral and public historian, working primarily with postwar migrant and refugee communities in Australia. She was awarded her PhD in History at the University of Melbourne in March 2015. She has published on child migration, popular culture, migrant centres, and public history and heritage in Australia. She is currently researching migrant hostels and camps, family settlement patterns, and heritage making practices within migrant communities. Her book Histories of Controversy: Bonegilla Migrant Centre will be released with Melbourne University Publishing in August 2017.